EUROPE: A record amount of offshore wind went online in 2017, but installation rates are expected to slow beyond 2020. Last year’s capacity increase follows the highest and second highest investment levels on record – €13.1 billion (US$16.3 billion) in 2015 and €18.2 billion (US$22.6 billion) in 2016 – according to analysis by WindEurope. But the first decrease in final investment decisions (FIDs) since 2012 – €7.5 billion across six projects (US$9.33 billion) last year – and European Union member states reaching their renewables targets, means annual installation rates are projected to decrease in 2020 and level out thereafter. 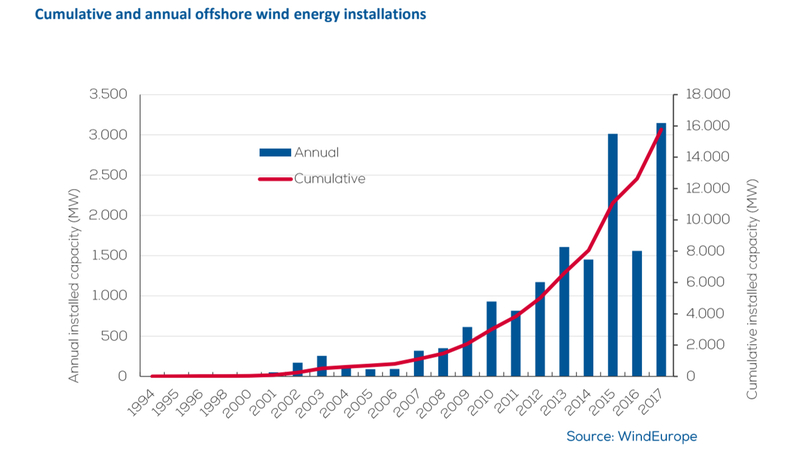 Still, a new record installation rate for offshore wind is expected in 2019, and by 2020, Europe will have 25GW of grid-connected offshore wind, according to WindEurope’s Offshore wind in Europe report. Europe now has a total installed offshore wind capacity of 15,780MW, generated by 4,149 grid-connected wind turbines spread across 94 wind farms in 11 countries, according to the analysis. Last year, a record 3,148MW of net additional capacity was installed, which was twice as much as the previous year (1,558MW in 2016). This corresponds to 560 new offshore wind turbines across 17 wind farms. Fourteen projects were completed in 2017. The bulk of this new capacity was installed off the coasts of the UK (1,679MW) and Germany (1,247MW). In total, €7.5 billion (US$9.33 billion) worth of FIDs were made in 2017, accounting for 2.5GW spread across six projects. This marks a 60% decrease from 2016 and is the first decrease in investments since 2012. Investments in the offshore wind sector are expected to top €9 billion (US$11.2 billion) by the end of 2018, with much of this capacity coming from projects awarded contracts in auctions over the last two years. 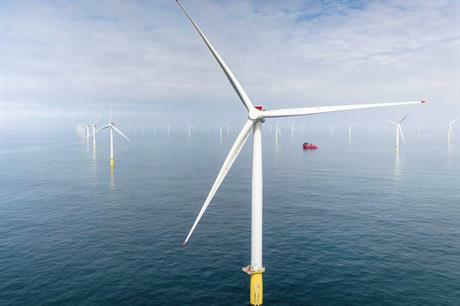 Projects expected to go through FID in 2018 include sites off the coasts of the UK, Denmark and the Netherlands, as well as floating wind farms off Portugal and France, and have an estimated combined capacity of 3.9GW. Meanwhile, 82 turbines – equivalent to 1,927MW – are awaiting grid connection, and work is taking place at a further 11 projects off the coasts of Germany and the UK. Once these projects are completed, the total installed grid-connected capacity will increase by a further 2.9GW, bringing the cumulative capacity in Europe to 18.7GW. By 2020, offshore wind in Europe is projected to reach a total installed capacity of 25GW, according to WindEurope projections. The industry association’s report also shows that both turbines and projects are getting bigger. 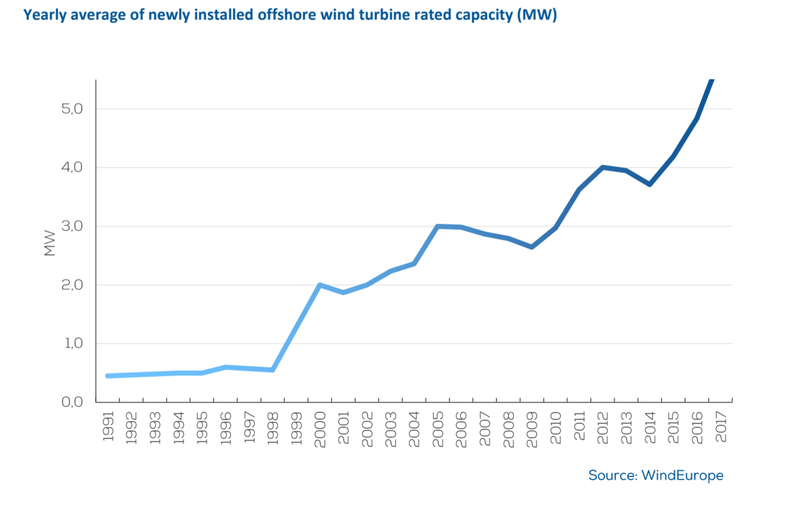 The average rating of installed offshore wind turbines was 5.9MW, a 23% increase on 2016. Meanwhile, the average size of the grid-connected offshore wind farms in 2017 was 493MW, 34% higher than the previous year. Monopiles are the dominant substructure in Europe’s offshore wind farms, with an 87% market share. Jackets and gravity base foundations respectively make up 9% and 2% of the total installed substructures, while 2017 also saw the installation of the first floating projects.